Our unique stuffed wild animals are proud to be different. These rare stuffed animals are not only rare as plush toys but many of them are also increasingly rare in the wild. 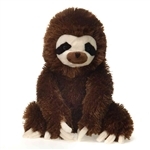 Many of these unique stuffed wild animals are from Central and South America, like the stuffed three-toed sloths, the plush coatimundi, and the plush kinkajou. You'll also find some unique Asian animals like the plush tapir and the various stuffed takins. These unique stuffed animals are not your average, everyday, run of the mill creatures. You must be an avid fan of wildlife to even be looking for these types of animals and we think that's great. It's probable that you know more about these unique stuffed wild animals than we do so we'll let you get on with picking the perfect uncommon critter and wait patiently by the phones to answer any questions you might have about any, or all, of them. If there's a particular unique wild animal that you don't see here and can't find anywhere else on our website then feel free to call us and let us know. 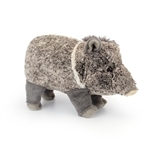 We're always adding new products and would be glad to do our best to find more types unique stuffed wild animals that we don't currently offer.